Home > News > Can We Create Social Change Without Money? Can we create social change without money? I don't have a conclusive answer but just holding that question can raise some very interesting insights. Since we're talking about money, I thought I'd start with a story on Wall Street. One of my friends was running a venture fund on Wall Street. They had a great year, and his boss calls him in to congratulate him and offers the proverbial blank check, "What would you like?" He looks his boss in the eye and says, "What I'd love is a minute of silence before all our group meetings." Wow. The boss is thinking, "In a context where people are billing every three minutes, a minute of silence to do nothing? That's like wasting time." He refuses. "No. Anything else?" he asks. No. After sleeping on it, though, the boss comes back to say, "Look, if you really want that minute of silence, fine, I'll give it to you." They start meetings with a minute of silence. That minute turned into two to three to five minutes. Today, they do thirty minutes once a week, and even have their own meditation bell. What was my friend thinking? On one side he could've asked for a monetary raise, but on the other side was very different kind of capital — mental quiet, connection, trust. He is thinking, "I don't want to meet people in a space of rush. I'd rather meet them with a bit more peace." It changed his relationship to himself, it changed his relationship to other people and certainly with his boss. And it didn't just stop there. It changed how everyone related to each other. It changed the whole culture of their office space. And that was something he valued more than the financial capital. How do we broaden our lens to include alternative forms of capital? This is a question, this is a possibility, that we all have access to but in our current world today, we're very biased towards financial capital. In theory, our society is supposed to balance all these biases. We have three big sectors. The private sector is rooted in extrinsic motivations like money, power, fame. On the other end, we have the voluntary sector that is rooted in very intrinsic sort of motivations. Compassion, knowledge, purpose. And then there's the public sector that is supposed to regulate between the two and work on both sides of the aisle. This is how it's supposed to work in theory. In practice, though, the private sector starts to take over. In fact, it starts to dominate. We do have a public sector, but the public sector is increasingly being controlled by the private sector. 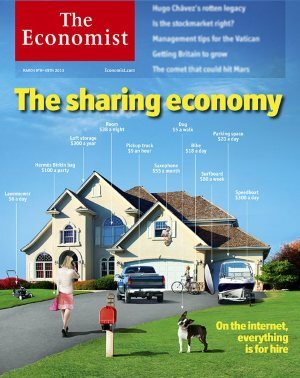 There is a small voluntary sector, but these days, in the name of the sharing economy, even that is being commoditized. Courtesy of the "sharing economy", your lawn mower can get you six bucks a day, and you can rent out your Hermès purse for a hundred dollars a party and your dog for five dollars a walk. When we have a hammer, everything starts to look like a nail. If money is the only metric we have, we start to put a price tag on everything. The problem with price tags is that we start to lose connection with the priceless. We start to lose connection with our intrinsic motivation. What does science say about all this? Edward Deci at the University of Rochester has been studying incentives for over forty years. After thousands of experiments, he categorically asserts that the carrot and stick model doesn't work. This idea of a contingent reward — if you do this, you will get this — doesn't actually work. For example, he studied people who loved to solve puzzles. Initially, they would solve puzzles just for the love of it, just for its intrinsic enjoyment. Then he started to pay them to do the same thing. So far so good. Then, at a later point, he stopped paying them. As soon as he stopped paying them, you would think they would return to that original state, right? It turns out, though, that they were no longer interested in solving puzzles at all! What his research shows is that money desensitizes us. What science is actually telling us is this: Don't show me the money. When you're working with intrinsic motivations, financial rewards can backfire. At the Max Planck Institute, researchers have been studying 18-month olds. These toddlers are just playing and all of a sudden they see a bunch of strangers who are putting clothes out for drying. In the process, they drop a clothespin and need help getting to it. 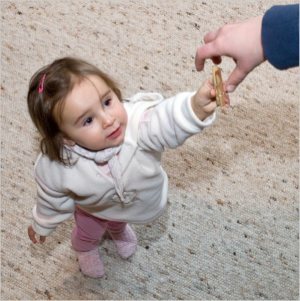 The toddlers see that a person is in need, and immediately go out to help. They pick up the clothespin and hand it to the strangers. Now, at that age, they haven't yet been taught kindness or compassion but they're still moved to help. They're still moved to cooperate. What science is telling us is that it's natural to give, that we're wired to care. In fact, not only is it guiding us to "don't show me the money", but it's saying to not offer any rewards at all. It's just not necessary. The question we are left with is this — what designs emerge when we don't lead with money? What designs emerge when we lead with something subtler or something internal? We have many examples that offer insight into this inquiry. Mother Teresa, of course, is an example that all of us know about. Someone purely motivated by intrinsic motivations. One of my friends, Lynne Twist, is a world-renowned fundraiser and author of a book titled, Soul of Money. She knows money. Many years ago, she had a very interesting conversation with Mother Teresa, whom she knew personally. "Mother Teresa, what's your fund raising strategy?" she asked. And Mother Teresa, with her big-hearted compassion, simply replied, "Oh, I just pray. Whatever I get is what I need." It was simple. Here was a woman who had 400 centers in 102 countries and she's kind of like the CEO of this whole operation and she is saying, "I have no fundraising strategy." Or rather she is saying, "My fundraising strategy is to be rooted so deeply in intrinsic motivation that external security is not even a concern." We have many modern examples as well. Linux rivaled Microsoft Windows purely with a distributed army of volunteers. Wikipedia did that with Encyclopedia Britannica. On Wikipedia alone, through those micro-edits that volunteers made, hundred million volunteer hours have been donated. CouchSurfing, similarly, allowed strangers to stay on each other's couches and disrupted the hotel industry. As we look closely, we see an entire spectrum of motivations. It starts with extrinsic motivations on one side and goes all the way to intrinsic motivations. On the extrinsic side, there's money, power, fame; somewhere in between you have things like fun, learning, growth and purpose. Then on the intrinsic end of the spectrum, you have these very profound motivations like healing, forgiveness, inner-transformation and ultimately compassion. On that extrinsic end, we have thousands and thousands of examples, but on the other side, on the side of intrinsic motivations, we don't have too many. Alcoholics Anonymous, for example, is a completely decentralized, distributed, and a never-monetized effort. It points towards the other end of the spectrum, but we have an opportunity to create a lot more examples here. Back in 1999, we started ServiceSpace that rested squarely on the intrinsic end of this spectrum. It started with four of us, building websites for non-profits. Underneath the work, though, what we wanted to do was to anchor ourselves purely in the spirit of service. Over the last sixteen years, we've organized around three core principles that have kept us rooted in that intrinsic motivation. The first one is that we are volunteer run. Many people look at that as scarcity of paid staff and ask, "How will you scale?" What we noticed was that we actually had an abundance of social capital. Imagine that you're trying to raise a million bucks. You could get it from one or two people, or a dollar from a million people. Which is stronger? A million people saying, "Yes, I believe in what you're doing. Yes, I care." The cumulative energy of that is profound. It's powerful. That's what we were experiencing with small contributions of time from many volunteers. Similarly, our second principle is to not fundraise. When you don't ask for resources, you naturally feel a lot of gratitude for all that ends up in your lap. You learn to creatively work with what you've got, and you start to cooperate. Incredible synergies emerge, particularly when working with non-financial capital. Lastly, our third principle is to focus on small. It wasn't about big things outside, but rather it was about the subtle on the inside. Being in the change you wish to see in the world starts to attune us to the subtle. The resulting awareness, in a very profound way, ignites our deepening understanding of interconnection. With these three principles, ServiceSpace manages to create lot of impact in the world. We started by building websites for non-profits and we ended up helping thousands of efforts come online. Then we started building portals like DailyGood and KarmaTube. Every year we send seventy million emails, and not a single one of them has an ad -- or even a reference to buying something. It is purely non-financial. Still, how far can we push ourselves while still operating solely on the strength of these intrinsic motivations? We started this game of kindness called Smile Cards and it spread to over a hundred countries. 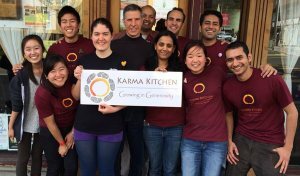 In local communities we started these gift-economy experiments like Karma Kitchen where people are redefining what it means to engage in transaction. In living rooms around the world, Awakin Circles started. In all, more than half a million members were co-creating something that was engaging the attention of millions -- all without ever raising a single penny, and moved by love, service and our innate connection to each other. It's not just that you can do a lot with this. We often take metrics from the extrinsic side of the spectrum to measure the impact on the intrinsic end. That puts a very low ceiling on its potential. Operating with the power of intrinsic motivation alone fundamentally changes the way in which we relate to each other. It gives birth to a whole new realm of possibilities. Karma Kitchen is like a regular restaurant, except that at the end of the meal, your check reads zero. It's zero because someone before you has paid for you and you get to pay forward for somebody after you. You are trusted to pay forward whenever you want. When people are just giving for the love of it, it changes the way they interact in that collective space. It's a profound idea that has worked wonders in seventeen places around the world. What works, though, isn't the intellectual idea -- it's actually the experience. It's actually realizing that when you walk in, the greeter is a volunteer. The person who is waiting on your table, the person who plates your food, the person who's bussing your tables, they're all volunteers. That guy doing dishes in the back, who signed up to be on his feet for six hours, to just do dishes so you can have an experience of generosity, is also a volunteer. When you realize this, it begets a very different kind of generosity in you. A flow of deep compassion emerges. It's very natural. Minah Jung was a student at UC Berkeley when she first volunteered at Karma Kitchen. She was so moved by the concept that she decided to study it. In fact, her research on Karma Kitchen and other gift economies became her PhD thesis. With eight different experiments, she poured through data with academic rigor, and came out with a seminal paper titled, "Paying More When Paying For Others." If you create a strong context, people respond to generosity with even greater generosity. Richard Whitaker runs his art magazine in the same way. He was running it for fifteen years with the traditional subscriber model, and then he ran across ServiceSpace and said, "Wow, this is great. This is how I want show up in the world." He offered refunds to all his current subscribers and said, "From now on, the magazine will operate only offerings of gratitude." Similarly, Thuy Nguyen is experimenting with this pay-forward model at her acupuncture clinic. I want to end with this story of one of my friends, Uday-bhai. He's a rickshaw driver. By all traditional metrics, he would probably be a UN statistic on one of those poverty charts. He's a humble rickshaw driver but he has another kind of resource. He believes in love, he believes in people. Uday-bhai decided to run his rickshaw on a pay-it-forward basis. You sit in his rickshaw and there is no money meter. Someone before you has paid for you and you get to pay forward for people after you, whatever you moved to offer. He trusted that goodness in people, in the sixth largest city in India. Naturally, many asked him, "Is it working?" He says, "Here's my ledger. Point A to point B, point B to point C. Yes, some paid more, some paid less. On the whole, it evens out." Then he adds, "Let me also show you this other notebook. This is where I ask people to write down how they felt sitting in my rickshaw." 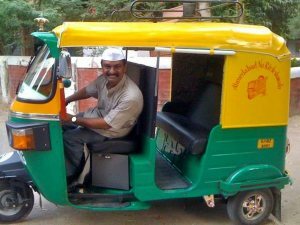 Imagine sitting in Uday-bhai's rickshaw and being completely caught off guard by the generosity of his process. This is not a billionaire doing philanthropy, but an everyday hero putting his entire livelihood on the line -- for love. It moves people to tears, people take vows for life. It's just deeply transformative and you can see that in all the notes. Uday-bhai didn't have money, but he had a deeper kind of resource. Through that resource, through his belief in our innate generosity, he created a massive ripple that is certainly changing the world. He is redefining what it means to have capital. He's diversifying that portfolio of wealth. When you do that, when you really start saying yes to that idea, you are essentially saying, "It's no longer about the CEO, it's about the everyday Joe. It's no longer about fundraising, it's about friend-raising. It's no longer about price tags, it's about the priceless." All of this sits on a single idea — what we will do for love will always be greater than what we do for money. May we all lead with love and change the world. Thank you. Nipun Mehta is the founder ofServiceSpace.org, a nonprofit that works at the intersection of gift-economy, technology and volunteerism. You can read more of his talks online. Why have random acts of kindness when you can have intentional acts of good will?